① Perfect solution for dog wash. Efficiently wash all sizes of dogs and cats. New design special for long hair dogs, Easy to rinse into the depths of heavy coat. ② One-handed operation with variable water flow switch lets you easily shampoo, wash, and rinse your dog. ③ This is completed set for pet shower system-Comes with shower head, 8 ft flexible hose, Divertor for your existing shower, Adapter for outdoor use and anionic filter. ④ Shower head with soft rubber. Can massage your pets comfortably during the shower. ⑤ Comes with six-months warranty. When your product gets faulty, just send photo to us. You can simply get a brand new replacement. ① Perfect solution for dog wash. Efficiently wash all sizes of dogs and cats. New design special for long hair dogs, Easy to rinse into the depths of heavy coat. ② One-handed operation with variable water flow switch lets you easily shampoo, wash, and rinse your dog. 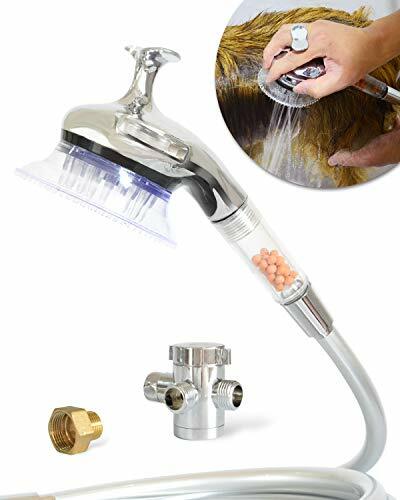 ③ This is completed set for pet shower & bath system, Comes with shower head, 8 ft flexible hose, Diverter for your existing shower, Adapter for outdoor use and anionic filter. ④ Shower head with soft rubber. Can massage your pets comfortably during the shower. ⑤ Comes with six-months warranty. When your product gets faulty, just send photo to us. You can simply get a brand new replacement. Publisher: JOY PET SUPPLIES CO.,LTD. Studio: JOY PET SUPPLIES CO.,LTD. If you have any questions about this product by SHELANDY, contact us by completing and submitting the form below. If you are looking for a specif part number, please include it with your message.